I used a program called Blade Designer to figure the measurements for our 8 foot windmill. As you can see from the screenshots, I entered in the length, number of blades, and number of stations. In this case, I wanted 8 6 inch stations to make the measuring a little easier. From this information I made my own diagram in Corel Draw. I've found that plotting a project out with a cad type program helps me understand more fully what I'm about to attempt for real in the shop. Several times I've avoided situations that would have been costly mistakes had I carried out my original plan. Here are the stations plotted out, along with the chord measurement for each station. Notice at station 1, the chord width is 9.69". 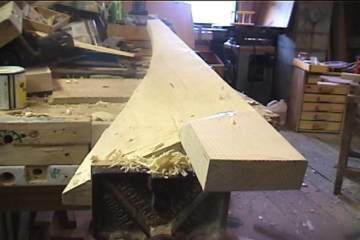 The spruce 2x10 planks I bought for these blades are only 9¼" actual width. As you'll see later, this isn't a problem because of the drop angle. 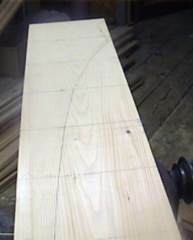 After drawing the stations on the plank, then marking the width at each station, I connected the dots to form the chord cut line. 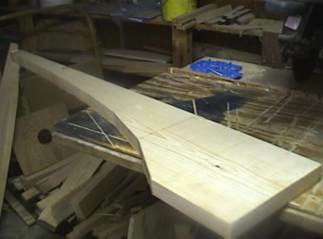 This is the shape of the blade from a frontal view. Now to figure out the "drop". Here are the same 8 stations, but from a left side (trailing edge, or TE) view. 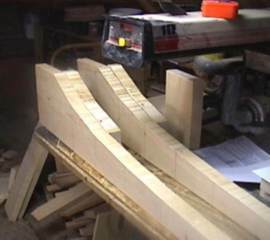 With a drop of 5.38" at station 1 I need 4 layers of 2x10 to have enough wood to work with. 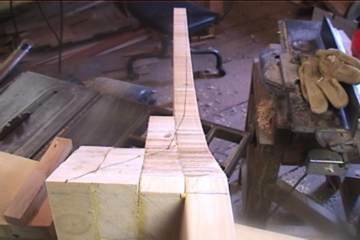 The orange area shows the wood that will be removed to form the proper curve for the front of the blade. 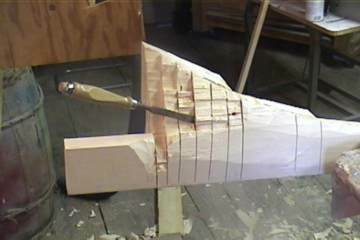 After trying to drawshave away the drop, I opted instead to use the slightly less exhausting method of saw and chisel. 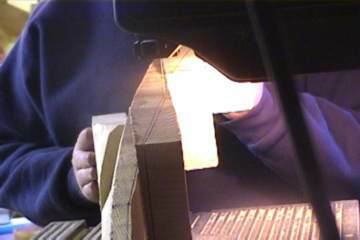 Because this is the front face of the blade, you can safely make a flat cut from the drop line to the leading edge. 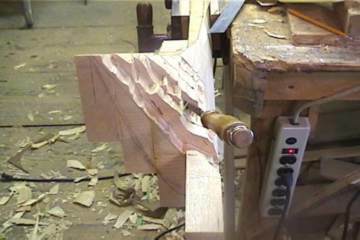 I gouged things up a bit with a chisel here, but was able to fix it with the drawshave and sander. The Blade Designer program defaults to 5 stations. I wanted to use 8 stations to make a smoother curve in the blade trailing edge. (seen in right photo) One side effect of using 8 stations is a shorter blade stem, 1/8 instead of 1/5, in this case 6" instead of 9.6". 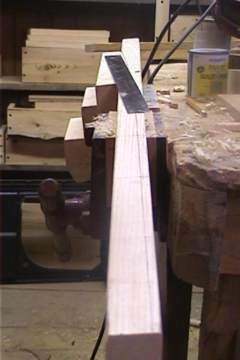 This also adds a substantial amount to the chord and drop measurements at station 1. I hope the 3.4 extra inches at the root of the blade will be worth all the extra work. 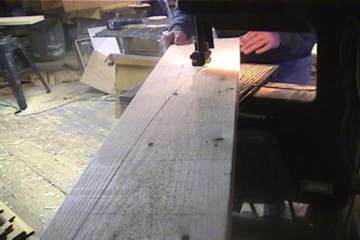 Left/Center: Marking the thickness and plotting line on leading edge. 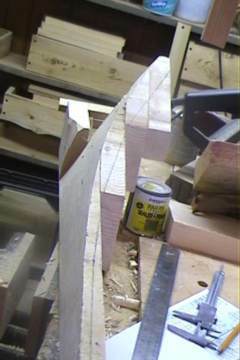 Right: The trailing edge of the blade will end up being very thin (1/16"). 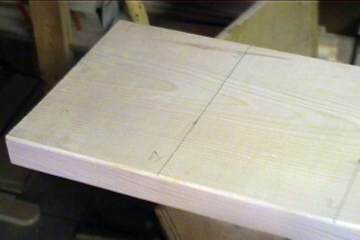 Because of this I don't worry when I run out of wood to mark the thickness on. 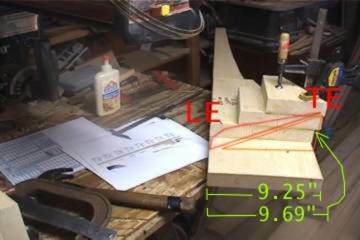 The thickness measurement is important 38% back from the leading edge. 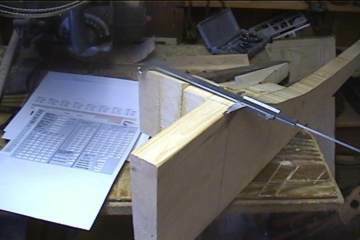 In the left photo I sketched an approximate airfoil to show where I could safely cut. I still generally use the thickness lines as a guide on TE and LE but it's O.K. if the stock isn't quite thick enough for a complete line on the TE. 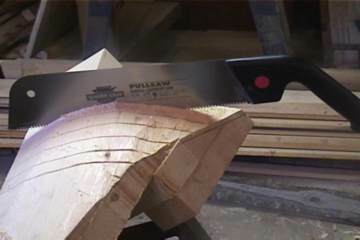 I used a bandsaw to cut away most of the scrap on the backside of the blade. 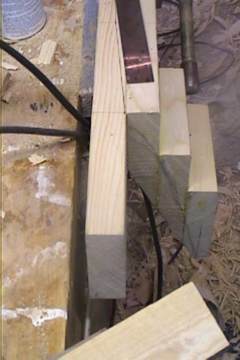 A drawshave and power hand planer made short of the rest.